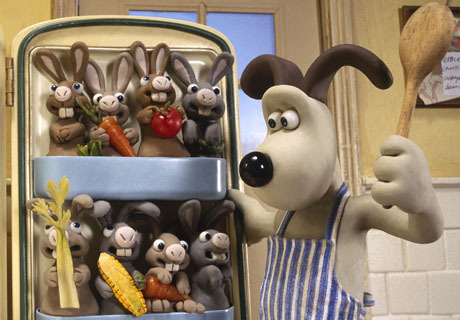 The cheese-loving Wallace (Peter Sallis) and his ever-faithful dog Gromit-the much-loved duo from Aardman's Oscar®-winning clay-animated "Wallace & Gromit" shorts-star in an all new comedy adventure, marking their first full-length feature film. What an absolute gem of a film! Rented this one as our "family film" of the week and EVERYONE was happy. What amazing animation, what a fabulous story and the comedy, while not TOP-SHELF laugh out loud was subdued and, well, cheeky. It was a BIT scary for the littlest one, but even she wanted to play it again when it was done. What a pleasant surprise. Animation was excellent and I enjoyed every minute. As far as non-Pixar kids movies, this is the best I've seen in a while. Those are some pretty ugly children......! An easy four-star outing here! I think I found it funnier than you did, Mikey. I had a stupid smile on my face the whole time, couldn't stop giggling. I LOVE claymation, and we rarely see it anymore (thank YOU, CGI), much less done so superbly. Nick Park continues his brilliant streak. Very clever story, humour, and characters. Too bad it takes so long between films, but always worth it. Any scenes with the bunnies were priceless!